This past weekend we were with some students from the Christians on Campus club at UC Berkeley for a weekend retreat in Sacramento. 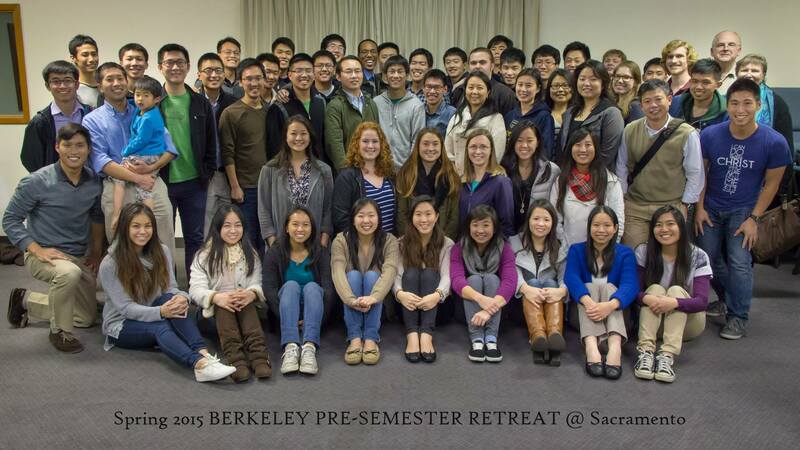 We have this retreat every winter as a way to kick off and prepare for the new semester. We went over some messages on the book of Exodus and I so enjoyed our times of eating the word together. As we prayed over the verses, the Lord was really faithful to speak to and through each person there. I particularly enjoyed two verses concerning the manna, one from the Old Testament and one from the New Testament. In the book of Exodus, God performed many miracles for the children of Israel, but only one miracle lasted 40 years. For 40 years while they were in the wilderness, God rained down bread from heaven for them to eat. Can you imagine that? Every morning little pieces of bread rained down from heaven and this was the only food that sustained them for 40 years! In the gospel of John, the Lord Jesus is referring to Himself when He says, “this is the bread which came down out of heaven…” He is the real manna and He came down out of heaven not as a king to rule us outwardly, but as little pieces of bread to feed us inwardly. If we eat of Him as this bread, we will also live because of Him (John 6:57). Just as the children of Israel, we believers today have the opportunity to experience this long term miracle every day. Every morning there is living bread raining down upon us, but we have to be faithful to gather our portion for that day. To do that, it’s as simple as reading a few verses a day and really chewing on them and taking them in as our spiritual food. As we do this, God has the way to change our diet and reconstitute our being. The forecast for today and the day after and the day after is manna. Don’t forget to go out and gather your day’s portion everday! Genuine spiritual life grows in desolate circumstances. We should not expect to always receive light when we read the Bible, to have the Lord’s presence when we pray, to save many sinners, or that our wife, husband, children, parents, and siblings will be spiritual. These expectations are unrealistic. Those who are genuinely spiritual pitch their tent between Bethel and Ai. God does not allow us to be free of desolate situations…God desires that we remain in the status in which we were called…If we can be normal human beings in our troublesome, complicated, and fallen situations, then we will have the genuine exercise of spirituality. Living between Bethel and Ai should be our normal experience. Our outward circumstances in coordination with the operation of God give us the opportunity to develop a genuine spiritual life. We should not expect to be in a situation that is heavenly and without any problems…We have the weaknesses and desolation, but we also have the Lord’s blessing. We must leave our spiritual longings and learn to experience God in our desolate situations so that we may have genuine growth in life. Is that not encouraging? To give some background, in Genesis chapter 12, Abraham was led by God to pitch his tent between Bethel and Ai. Bethel means “the house of God” and Ai means “a heap of ruins.” This is exactly where God also leads us to pitch our tent today. In our Christian life, our experience is often that we face the house of God on one side, but a heap of ruins on the other. We may be enjoying God in His house, but we also often find ourselves in the midst of many desolate situations that cause us to wonder if God is really with us. So often I have the mistaken concept that the more I grow in the Lord, the easier my life should become. But I was so helped to be reminded that genuine spirituality and growth comes out of the experience of Christ in the midst of all the desolate situations. We should never expect our life to be problem free, but our normal experience should be one of living between Bethel and Ai. One day last week the Lord reminded me of this in a very practical way. It was a regular weekday and the day began as all other regular weekdays begin. Some time after breakfast CC discovered that his little brother had destroyed his Lego creation from the night before and a level 9 tantrum ensued. Let’s just say the situation quickly deteriorated from there. We missed the school bus, and as I was trying to get the boys out the door so that I could drive CC to school, they began fighting about who would open the door. By the time I got both screaming boys buckled into their car seats, I was on the verge of screaming myself. I was tempted to just leave them there and go back into the house and crawl back into bed. That’s when the Lord spoke that portion to me again. Here I was in the midst of a desolate situation, here I am facing Ai, but that is perfectly normal. If in the midst of that, I turn to the Lord and learn to be a normal Christ-enjoying mom to my children, then that can be an experience of genuine spirituality and growth in life. So as I drove, I let the boys scream until they were all screamed out. I inwardly called on the Lord and tried my best to speak to them with my soft non-screaming voice. I don’t think I ever had the chance to get into the Word or spend much time in prayer that morning, but I felt like I touched the Lord and had a real experience of Him in the midst of that loud minivan. When we cooperate with His operation in the middle of our troublesome circumstances, whatever they may be, then God will really be able to grow in us in a practical way. It’s high time I brought Truth Tuesdays back! For those of you who don’t know what Truth Tuesday is, it’s basically my way of staying accountable to myself to make sure that I’m in the word in a regular way. For a while I was pretty good about posting every Tuesday about any fresh enjoyment or nourishment I had received in my time with the Lord in the word. Then summer came along…and school started…and life got busy, and even though it’s not like I haven’t been reading the Bible or enjoying the Lord, I have to admit it hasn’t been that regular and because I haven’t been posting, it’s hard for me to recall all the truth I have enjoyed in the past few months. I find sometimes when it comes to what God shows me in the word, it’s those things that I share with others that really stick with me in the long run. When I just keep my enjoyment to myself, it becomes fleeting and hard to recall. So since I’m not so bold to go around speaking it to people (although I’m really praying that the Lord would change that), I’ll use this space instead as my way to share the word so that more of it will stick with me. Hopefully, some of you out there will enjoy these posts as well. In a lot of Truth Tuesday posts I had written about what I’ve gotten out of my slow reading of the Life-study of Genesis. Well, I’m happy to report that I finally finished it, all 120 messages! Woohoo! Now I’m in the Life-study of Exodus, which has 185 messages, so with my current schedule, it’ll probably take me about a year to finish. It’ll be slow going, but I guess when it comes to being constituted with the truth, the tortoise wins the race. So expect to hear a lot about Exodus from me on Tuesdays. One small point I’ve enjoyed so far in my reading is concerning God speaking to Moses out of the burning bush in Exodus chapter 3. While Moses was in the wilderness, God appeared to him “in a flame of fire out of the midst of the thornbush” (v.2) Why is this so significant? In Genesis we see that the thorn bush was a sign of man being under the curse. God cursed the ground with thorns because of man’s fall. And the flame of fire in Genesis guarded the tree of life; it was an excluding flame which kept sinful man away from God’s holiness. In Genesis 3, the thorn bush representing fallen man and the flame of fire representing the holy God were diametrically opposed to one another. But in Exodus 3 the situation is altogether different. These two diametrically opposed things actually come together. Moses saw the flame burning in the midst of the thorn bush. Hallelujah! The thorn bush becomes the vessel for the flame and even becomes one with the fire. That means that even though we’re fallen and cursed, God through His redemption still found the way to dwell in us and become one with us. The very flame that once excluded us from coming to God can now visit us and dwell within us. We Christians are cursed thorn bushes like everyone else, but the difference is that we have a flame burning within. And not only did Moses see a thorn bush burning, but he also saw that “the thornbush was not consumed” (Exo. 3:2). The thorn bush was burning, but it was not burned up. That means when God comes into us, He doesn’t consume us. God was reassuring Moses…yes, I’m calling and sending you, but don’t depend on yourself to be the fuel for what needs to be done. The fire doesn’t need you to be the fuel, it just needs you to be the vessel in which it can burn. Sometimes Many times in my Christian life, I feel burnt out and why is that? Probably because I’m relying on my thornbushy self to do everything. Let’s face it, thorn bushes are just kindling, they’ll burn up in seconds. Our natural life can never be the fuel for what God has called us to do; only He Himself can be the fuel. This simple picture in Exodus shows us the paradox of the Christian life – a thorn bush burning yet not consumed. I pray that this would really become our experience. May we common thorn bushes allow the God of glory to burn more brightly in us this week! I know today’s not Tuesday and that yes, yes…I’ve been awfully delinquent with my Truth Tuesday posts. But I have been enjoying things in the Word; I just haven’t had time to write them down and before I know it, another Tuesday has come and gone. So this portion of enjoyment is actually from a couple weeks ago. I’ve slowly been working my way through the Life-study of Genesis (I took a break for a while, but now I’m back on track!). I’ve read through the life of Abraham and Isaac and now I’m in the real meaty part of Genesis – the story of the life of Jacob. And what a story it is. I think Christians may sometimes tend to uplift people in the Bible like Abraham, Isaac, or Moses, but Jacob? Not so much. From the womb it was clear that Jacob was a clever trickster, hence his name which means “supplanter” or “heel holder.” Unlike David or Daniel, he wasn’t the kind of person you’d want your kids to emulate. He tricked his brother Esau not once, but twice, out of his birthright and his father’s blessing (although the second time he had some help from Rebekah, his dear mother). As a result he was forced to run away from home and ended up at the house of his uncle Laban. Unlike his father Isaac, Jacob’s life was a life of sufferings and dealings, some brought on by his own mistakes and some arranged by God’s sovereign hand. He suffered under the hand of Laban, who was even trickier than him. I’m sure you are all familiar with the story of how Jacob worked for Rachel but got Leah instead. He had numerous dealings when it came to his wives and children (can you imagine having twelve sons?). I would definitely not envy such a life. But at the end of the book of Genesis (which I haven’t gotten to yet), Jacob is a fully transformed person. In fact, he is no longer Jacob, but Israel. We see a maturity in this man that was not there in his father Isaac or even his grandfather Abraham. He started out a conniving and sly person who always had a back up plan, and ended up a transformed person who was fully accepting of his circumstances and environment. In the beginning he’s striving to grasp the blessings, but in the end, he’s the one who blesses even Pharaoh. What hope that gives us all! Our sufferings and dealings are not in vain, but if we love God, they will work together for good to produce more growth of the divine element in us (Romans 8:28). Anyways, that’s just all background. What I really enjoyed a couple weeks ago in my reading was that a big turning point in Jacob’s life was in Genesis 28:10-22. Here Jacob had just run away from his parent’s house and is in a strange place by himself with no where to rest. When night comes, he takes a stone and lays it under his head as a pillow. Curious, isn’t it? Why a stone? Why not a pile of leaves or dirt, or some soft grass? A stone doesn’t seem to be that comfortable to lay your head on. But it’s very significant. A stone is solid, not man-made, and if you read in other portions of the Word, you’ll see that Christ is the real stone and God wants to transform us all from men of clay to living stones. Jacob realized that he couldn’t trust or find rest in his natural resourcefulness, his conniving ways, but that the only rest for him was to lay on this stone. In our experience we all come to a time when we’re lonely, out of ideas, don’t know where we are or where to go. It’s at this time that we need to lay our head on Christ as our stone. He becomes our real rest and satisfaction. It’s at this point that Jacob also first meets God. He has a dream of a ladder with angels ascending and descending upon it and Jehovah Himself speaks to Jacob from above the ladder. God promises to be with him and to keep him as He was with his father and grandfather. When he wakes up, Jacob takes the very stone he rested on and sets it up as a pillar and calls the place Bethel, the house of God. How wonderful! The pillow becomes a pillar! The very Christ we experience as our rest and satisfaction becomes the material God uses for building His house. To us this stone is a pillow, but to God, this stone is a pillar for His house. As we journey on in our human life and Christian life, which may be full of sufferings and dealings as Jacob’s was, I hope we would all have this experience of meeting God at Bethel. If we know Christ as this stone pillow/pillar, then whatever happens to us will work for our good to make us the real Israel of God. I’ve tried writing this post a couple of times today, but kept getting interrupted. Now both kids are finally in bed and I’m staring at the blank computer screen trying to think of what I’ve enjoyed in the Word recently that I can share. Truth be told, I’m having a hard time coming up with anything. The last couple of weeks have been filled with sickness, busyness, exhaustion, and just a bad case of the blahs for me. I have to confess that I haven’t been as diligent to get into the Word or that desperate to spend that personal time with the Lord in the mornings. When I don’t have that daily spiritual supply, things generally go downhill. It’s kind of like when you’re sick and you know you need to eat to get better, but you just have no appetite and no strength to get yourself to the fridge. Except that as all moms know, even when you’re sick and you don’t feel like eating, not feeding the kids is not an option. So for the sake of those little hungry mouths, you somehow find the energy and strength to drag yourself to the kitchen, to put that pot on the stove, to come up with something edible to fill those mouths…and in the process you’re somehow able to feed yourself as well. This has been my experience both physically and spiritually. If it were not for my kids, I’d probably go through some days without eating…or at least not eating well. I think the same applies when you have spiritual children. When there are some that you are caring for, you often have to eat for their sake. When others come to you with spiritual needs, that in turn forces you to go to the Lord. I’m reminded of the parable in Luke about the person whose friend came to him at midnight to borrow three loaves. He didn’t have anything to offer his friend so he goes to another friend to ask for the food. That’s the context of Luke 11:9-10, verses that so many Christians love but probably misunderstand – “Ask and it shall be given to you; seek and you shall find; knock and it shall be opened to you. For everyone who asks receives, and he who seeks finds, and to him who knocks it shall be opened.” It doesn’t mean that if you ask for that new BMW you will receive it because the asking, seeking and knocking here is not for your own needs, but for the needs of others. If we ask and seek the Lord for the supply that we can minister to others, He will surely grant it to us. And the wonderful thing is that while we’re meeting the needs of others, our own needs get met as well. So even though I don’t feel like it sometimes, I know somehow I need to get myself to open that Bible because that’s where the food is. I know I need to enjoy and process the word I read so that I can feed it to others. I know I need to be desperate in seeking the Lord because you never know when someone will come to your door at midnight in need of three loaves. 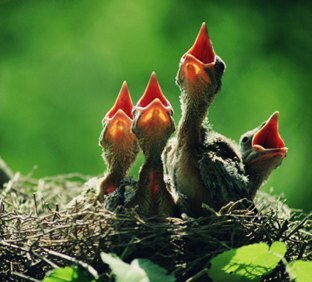 Having hungry little mouths around you is the best cure for the case of the blahs. It’s been a rough couple of days…I’ve been on the verge of sickness for awhile and having a couple of nights where I couldn’t fall asleep until 1 or 2 am didn’t help matters. We had a very full and tiring (but good) weekend and are now in the throes of an even fuller and busier week. I had no time for my Five Minute Friday post last week and was about to skip my post for today as well because I really felt like I had nothing to share in terms of my enjoyment in the Word. What struck me when I was praying over this verse is that the Lamb is the One shepherding us. Isn’t that strange – to have a lamb as a shepherd? 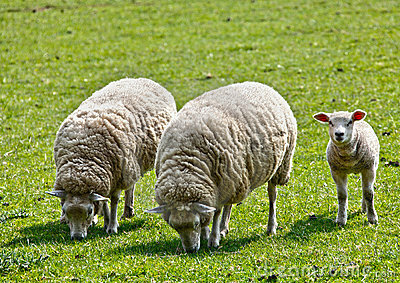 What would you think if you saw a flock being shepherded by…another sheep? I think I’ve always appreciated the fact that the Lord is my shepherd, but this morning I appreciated the fact that He’s a Lamb-Shepherd. He shepherds us as one of us, even as one of the weakest of us. Maybe that’s why His care is so thorough and fine. He is no stranger to our human experiences, but has been tempted in all respects like us. He knows what it’s like to be exhausted at the end of a long day, to have your body weakened by sickness and sleep deprivation. As our Lamb Shepherd He is fully able to sympathize with whatever we’re going through, but not only that, He’s also able to guide us to springs of waters of life. As He leads us to drink of the springs which satisfies our thirst, God is able to wipe away all our tears of dissatisfaction. So whatever kind of week you may have ahead of you and however you may be feeling, let this Lamb shepherd you. He knows exactly what you need. Follow Him and you will find yourself drinking from the springs of waters of life. As promised in my previous post, I wanted to share a little enjoyment from the recent Winter Training on the Crystallization-study of Genesis, a week long Bible conference I attended in December. The training covered Genesis chapters 12-24, focusing mostly on the life of Abraham and Isaac. There were so many points that impressed me and I definitely need to spend more time to study to really get into them all, but one thing that I came away with was the appreciation for the simple title, “the God of Abraham.” Many times in the Bible, God is referred to simply as the God of Abraham. Have you ever stopped to wonder why? Abraham wasn’t a particularly significant figure in world history; he wasn’t a king, had no cities named after him, you can’t find a single edifice or statue of him anywhere. Why would the God of the universe choose to define and call Himself the God of this one man? Surely the almighty God is the God of everyone and of everything; so why would God Himself tell succeeding generations that He is simply “the God of Abraham”? There is so much to unpacking this title – it reveals to us that God is a God that is closely related to humanity, even to individual persons. It also reveals that He is a God of history; He reveals Himself and speaks through man’s experiences and dealings with Him. The Old Testament is filled not so much with the direct speakings of God but with stories of people’s experiences. God’s history is not written in fables and myths, but in human experiences. And that is exactly what made Abraham so special – his life was one filled with experiences of God’s speaking, God’s calling, and God’s appearing. He started off, like we all do, in a land of darkness and idolatry, but the God of glory appeared to him. And like most of us, he was not a giant of faith, but dragged his feet in following the Lord and needed God’s repeated appearing. His life of sojourning was a life of getting to know the God who called him. In all his experiences, he realized that God can provide for all his needs, that He’s a God who can fight for him, that He’s a God that can call things not being as being by giving him a son at the age of 100, that He’s the God of resurrection in raising that same son from the dead. In the life of Abraham we can see who God is – He’s the faithful One, the all-sufficient One, the eternal One, the One who can call someone out of Chaldea and bring him all the way to Mt. Moriah. Abraham’s history became God’s history. So what about us? How much of our history can be considered God’s history? One thing that encouraged me was that Isaac and Jacob were people that started off knowing God only as the God of Abraham, the God of their father and grandfather. But because they themselves also lived a life of having personal experiences with the Lord, their names also got included in the title. When Jehovah appeared to Moses, He said I am the God of Abraham, the God of Isaac, and the God of Jacob. The experiences of these three men give us a complete revelation of who our God is and the work He must do in all of us as believers. We may start off only knowing God as the God of our parents, but at some point in our life, He has to become “our God.” For our life to have any meaning, it has to be one in which God can write His own history. In contrast, Abraham’s nephew Lot, who had spent so much time with his uncle, never had any personal appearing from the Lord and so God remained the God of Abraham to him and never became his God. As a result, he drifted to Sodom and his story in the divine record ends after his pitiful escape from God’s judgment on that city. May we all aspire to have more history with God. Our Christian life might be filled with failures, but as long as we have God’s repeated appearing, calling and speaking, at the end of our life we can look back upon all our experiences and be confident that we know God and we know His ways. Then He will not be ashamed to be called our God.